His first live music experience was a Legends of Rock gig at Melbourne Tennis Centre. “It was amazing, I must of been about 9 or 10 years old seeing everyone from Chuck Berry, Jerry Lee to Bo Diddly.” But Shaun’s real obsession with the guitar started when late one night he was watching the T.V and a special came on….AC/DC live at the Apollo. “There was this guy, school uniform with a guitar and hand in the air, the crowd went nuts….and bang! Riff raff started”. Around the same time his dad handed him a bunch of records from an old friends collection. Jimi hendrix’s ‘Are you experienced’ was in there and from the first notes I was hooked.“It was that musicianship that laid the foundation for me, the sounds and playing where out there”. With that inspiration ingrained Shaun asked his parents for a guitar, which became his constant companion. At 13 years old Shaun was asked to join his first band. “I went to these older kids houses and tried out, dad dropped me off after football, I was nervous as”. He was recruited and given the job of lead guitarist, playing school formals and house parties. “For me life was all about football and guitar.” Something had to give and after finishing school Shaun decided to take up full time work as a musician playing 5 nights a week in night clubs and pubs while playing his original music on the off nights. “I was earning good money for a 18-19 year old, I could buy all the Records, CD’s and equipment I wanted”. By then his musical tastes covered everyone from Pink Floyd and the Doors, Weather Report, Coltrane and Holdsworth to Country. “I’d listen to everything especially the stuff from the mid 70’s”. The love of guitar sounds had stuck with Shaun since hearing Hendrix and the music from that period onwards was adventurous and creative. “The effects that made the guitars sound like they where from outta space just did it for me” . Shaun started making his own effects and experimenting with his own guitar setups over the next few years. When a lot of the venues started going out of business and closing their band nights down Shaun needed to stay within the industry. He was already working at a local guitar amp factory ‘Ulbrick’ in which he learnt much about the ins and outs of the musical equipment industry. When that shut down, Shaun decided to set up his own own Effects making business ‘Klinger Custom Pedals.’ “ Things took off really fast,” Shaun says “I was making pedals for Ian Moss (Cold Chisel), Brett Kingman (James Reyne), Bob Spencer (The Angels) and many other well known and cool musicians, it got to a point there was a real demand for orders each week”. Shaun was about to go on a 2 month tour with the Turk Tresize band to the U.S and decided to take a break from making pedals. “I wanted to refocus on what was important to me, my Music”. Over the past 20 years Shaun had travelled all over Australia with various bands playing at many key festivals, venues, Radio shows and the odd spot on T.V. Whilst on tour in the states it gave him the ability to refocus on his own music and the bands that were of most importance to him. While in the States Shaun was asked to play with successful local Nashville Singer songwriter Eric Lee Beddingfield. “Eric is a good guy he recently came back to Australia and we did a few dates for the 2017 Tamworth music festival with a band I put together for him”. It is this band in which we see where Shaun is at today. “It was made up with my mates from my original band and the Turk Tresize band”. Shaun is a full time member on Guitar for the Tresize band “We are like a big family, we have all been around the Melbourne music scene for a while”. The Drummer from this band is Shaun’s old friend Boz. “We have been playing together since we where kids so I got Boz to play on my Album”. It was a natural choice with Boz’s solid earthy playing you can hear why the two still play solidly together after 25 years. “He knows where I want to go with a tune and if I want to take it somewhere else he locks in”. Kit Riley the bass player on the Album is apart of Shaun’s Saturday night gig in the Andy Grant band . “His an amazing bass player and his feel and musical understanding is complimentary to my music, plus Boz and him sound flawless together creating the sound I need”. 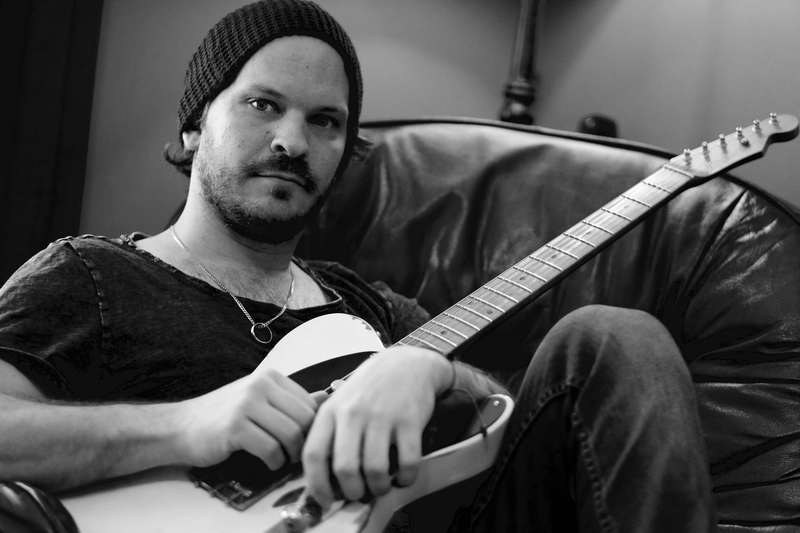 Shaun’s music is from the heart, his soulful raw vocal and skilful sonic guitar exploration complement each other. “This Album is a blend of sounds and styles in the rock format from artists who have helped to shape my approach and love of music. I wanted to make something that was broad enough to show my experience and give the listener an adventure, but focused enough to not alienate the general music fan”. With Shaun Klinger finishing 2017 on a high with his album released in November and after a busy and successful year of shows and tours in the U.S, playing shows in Nashville, New York and Hollywood plus doubling up playing with the Turk Tresize band. 2018 is already sizing up to be a great year, kick starting it off with a run of successful gigs at the Tamworth music festival with his band and is looking forward to many more in the coming year.